Though sport has been a part of the human experience for about as long as history has been recorded, the concept of professional team sports is relatively recent. Until industrialization came along, people simply didn’t have time for much leisure activity, but the mid-1800’s saw the emergence of the first professional football leagues (that’s “soccer” to all us uncultured Americans). Then in 1876 professional sports, specifically baseball, arrived in the US with the establishment of the National League. The American League joined the fun in 1901. The NHL, with a slightly more complicated history, can trace its origin to 1909. 1920 brought us the NFL and the NBA started in 1946. And with the rise of all these professional athletes came the rise superstition in sports. Why is this, you might ask? Well, historians have often noted that superstition is most pronounced in times when people feel they have little control over the outcome of their own lives. Professional athletes capable of competing at the highest level of their sport find themselves competing against others who are more or less equally capable. The result of this kind of competition is, more often than we would like, dependent less on pure talent than on circumstance. Often miscommunication, questionable calls by officials, and poorly timed injuries make the difference between winning and losing. How can a team protect itself from such unforeseen problems? The answer is obviously to conjure the most luck. Teams do this all the time. NHL teams famously refuse to touch their Conference Champion Trophies for fear it will bring them bad luck in their quest for the Stanley Cup and often the members of a baseball team will not shave during a post season run. My favorite team ritual by far, though, is that of professional rugby team, The All Blacks who perform a traditional war chant in front of the opposing team before each game. But whereas team rituals can be attributed to increasing team camaraderie, the personal superstitions of many professional athletes are just plain bizarre. They range from the unwillingness of baseball players to change places in the batting order, to rubbing the head of the bat boy, or commonly the refusal or insistence of stepping on particular markings on the field of play. It seems there’s no end to what rituals professional athletes will try in an attempt to give themselves a slight edge. But not all players put much stock in such behaviors. Babe Ruth, who once famously said, “I have only one superstition. I touch all the bases when I hit a homerun,” penned an article that ran in the Pittsburgh Post Gazette on May 28th of 1929, about his response to a fan’s suggestion that Ruth was wearing the wrong number. 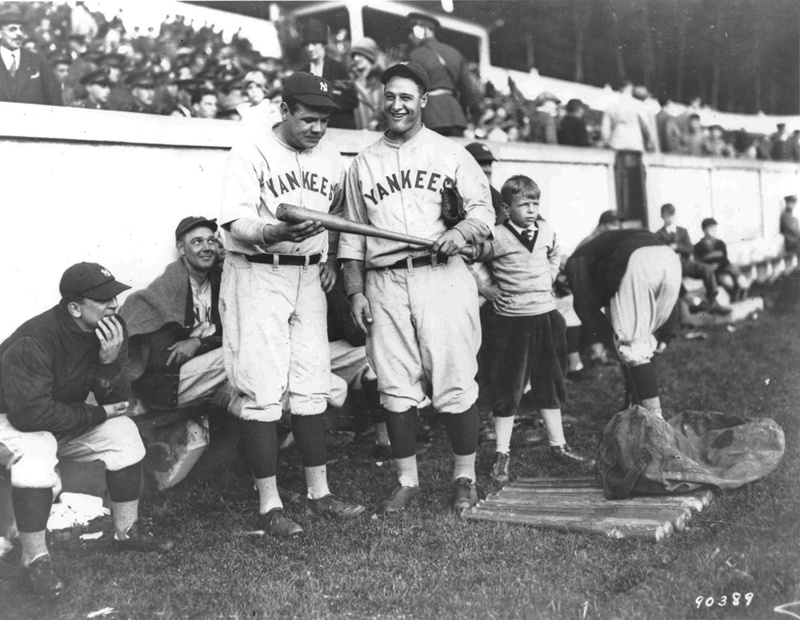 That year the Yankees became the first team to consistently wear numbers on the back of their jerseys and the Bambino wore the number 3 on his. The concerned fan, a self-identified numbers expert, explained that according to his observations of Ruth (who was in a minor hitting slump at the time), the player should be wearing the number 7. If he made the change, the fan insisted, he would have a great season. If not, Lou Gehrig, who sported the number 4 on his jersey (the appropriate number for him according to the “expert”) would certainly outhit Babe. In response, Babe had only this to say: “Somehow I’ve got a sneaking hunch that the number on a fellow’s back doesn’t have much to do with his hitting one way or another—and I’m a lot more interested in getting my eye on the ball right now than I am in picking out lucky numbers or studying the stars.” Turns out Babe Ruth probably didn’t do any harm by disregarding the fan’s suggestion. In 1929, he hit 46 homeruns, drove in 154 runs and had an overall batting average of .345. Not bad; and, notably, better than #4 Lou Gehrig. The Yankees did have an off year, though. Their pitching struggled terribly and even with heavy hitters at the plate, they weren’t able to pull off a third consecutive championship, finishing up in second place behind the Philadelphia Athletics. If I know anything about baseball fans, I’m guessing numbers guy wasn’t surprised. Because if professional athletes sometimes depend on a particular routine or good luck charm in an attempt to influence those factors that are largely out of their control, that is nothing compared to what their fans do. Fans are, after all, stuck on the sidelines, in front of the television, or tuned in to the game updates when our focus really should be elsewhere. Fans have no real control over the outcome of the game. All we can do is wish and hope and stress out. So for example, a practical historian known for rational thought and witty discourse (perhaps for her beauty and charm as well, but who can say) might convince herself that it is essential that she wear the same piece of jewelry every day of the playoffs as long as a certain flock of baseball playing birds from an undisclosed Midwestern city are still in contention. She might seek comfort during tense playoff moments by tightly hugging a plush toy of the team mascot. And perhaps she would even refuse to blog about her team until their postseason run is over. It wouldn’t be weird, though because it’s totally going to work. I’m sorry that the NL’s top defensive team for 2012 made 3 errors in that stupid one-game playoff against the afore-mentioned baseball birds. Otherwise, your feathered friends would be flying south for the winter and the truly deserving team would have already swept the Nationals. You doubtless know that said George Herman Ruth was an extraordinary pitcher but the Yanks saw how he could hit and figured they’d better have his bat in the lineup every day. The rest is histrionics. I do think the one game wild card playoff is a stupid idea, even though I can’t complain about it this year. Every team can have an off day and it comes down to who can handle the pressure best, which is, admittedly only one small factor in determining which team really does deserve a chance to be world champions. I will say this, though, had the tables been turned, I’m pretty sure Cardinals fans wouldn’t have behaved so badly. Of course, I’m pretty sure you weren’t at the game and had you been, you would have been a gentleman. Looks like this post still isn’t about the Cardinals!!! !